In this week’s Monday Morning Update, Mr. H mentioned the UberHEALTH promotion where customers could use the Uber app to summon a nurse to administer a flu shot. The idea came from John Brownstein, a Harvard epidemiologist who saw the mismatch between importance and convenience of getting a flu shot. After the success of the program, he feels it might be a possible delivery model for basic preventive care as well. Given the ebb and flow of my happiness as a CMIO of late, I decided to run the math and see what it would look like to take to the road. Although as an Uber promotion the nurses had a driver, I could certainly drive myself. That would cut costs right there. I’d be seeing fewer patients each day, which would actually lower my professional liability insurance premiums. I wouldn’t be paying rent or utilities either. I have a friend who has a retainer-based practice and does only house calls, so I know that I’d have to trick out a decent-sized vehicle that could handle vaccine and specimen storage, various equipment, and more, but it would still be cheaper than paying for office space. EHR costs would be about the same, although if I ran it as a cash practice they would be significantly less due to the savings in billing services, audits, etc. I went back and forth thinking about a cash practice. Looking at the percentage of cash-pay patients I see at a local urgent care, it may be more realistic than one would think. There are increasing numbers of patients with high-deductible health plans, which may make a reasonably-priced cash practice very attractive. Having limited equipment would actually help to keep costs down. There’s no temptation to order x-rays because it’s convenient if you don’t have a machine. Several countries in Europe offer house calls as part of standard medical care. One of my medical school classmates who lives in Germany recently had a baby and was telling me about her benefits. Rather than cutting services as payers do here, plans offer generous coverage and even things we wouldn’t think about. She was able to get “homemaker” services to perform light housework while she recovered from her delivery and had home visits from a lactation specialist and a pediatrician with very little out-of-pocket cost. Her family physician actually takes “first call” at night, alternating with other physicians, rather than screening the calls through an answering service. My friend asked her family doc how he liked that. He said the patients are respectful because they know they’re waking the doctor up and they only call if it’s an emergency. Because he’s the one on the phone with them, it’s easier to negotiate an office visit the next day or even a house call, rather than potentially just sending everyone to the emergency department. It’s certainly not inexpensive to deliver care this way. Coverage is funded by a flat percentage of each worker’s income that is paid to a non-profit coverage fund. It’s mandatory, but due to the flat percentage, it varies by income, with higher wage earners paying more. Although most Americans would balk at paying 8-10 percent of our gross income individually for healthcare, when you do the math and look at what employers are paying, the cost of individual insurance, and the level of service, it seems like a contender. Although she’s a physician, my friend isn’t licensed in Germany and works part-time as a medical editor. She did mention that highly compensated employees can opt out of the requirement and purchase “private” coverage from a for-profit plan, but she doesn’t personally know anyone who has. My friend isn’t an expert on healthcare finance, but that model of care brings up some interesting concepts. She didn’t have a lot of feedback about EHR use among physicians other than to say that they’re significantly less stressed out about it than most of her friends in the States. I’d love to hear from readers that have deeper knowledge on those topics or who have experienced that type of health system first hand. I’d also love to hear from providers in the US who have incorporated health IT into either mobile or direct/cash primary care practices. 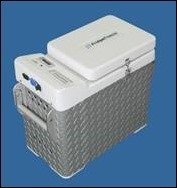 In the mean time, I’m going to start shopping for a vehicle worthy of a diamond-plate accessorized vaccine refrigerator. Got a sweet ride for patient care? Email me. You are dancing with universal healthcare Dr Jayne! I had a baby in England and my husband had eye surgery while we were there. My experience having a child was VERY similar to your friend. Very good care beforehand via midwife and occasionally checked by a doc. I had a Csection as it happened so I experienced surgery. All went great no complaints. Two interesting experiences were the amount of care at home for me and my baby. My son had his own team that came twice per week for 8 weeks and I had a nurse that came once a week for 4 weeks and made sure all the nursing activities were going well. During my hospital stay I requested a private room and was granted the room (they are rare where I was) but we were told it would be £20/day. We tried to pay on our way out and they had no way to take the payment. A 100% free pregnancy Csection and post care. No complaints! My husbands eye surgery was deemed elective (although we didn’t think so) and he would have had to wait several weeks. He opted to pay for it and go to a private doc and got it completed within a week. I think if more people experienced the type of care you get in these countries they would understand the real benefits above what the US system offers. Revenue vs cost basis.